Garage doors play an integral role for every home, but are often forgotten about until something goes wrong. If you live in Florida and are in need of garage door repairs or replacement, it can help to do research and inform yourself on the best way to restore your property’s beauty. The Sunshine State sees a lot of sun and wonderful temperatures, but the stormier seasons can lead to an increased need for professional garage door services. In situations like this, many citizens turn to Guaranteed Garage Repairs for assistance. Our team is proud to provide Top Rated Local® garage door repairs to Stuart, Sebastian, Hobe Sound, and beyond. For years, the Guaranteed team has worked to provide outcomes so great that we guarantee the results for each and every service. Nobody else has the training, equipment, or know-how to deliver results that are Better Than Best! Today, we’ll highlight a few of our most frequently asked questions concerning garage door repair and installation services for Florida homeowners. If you’re in need of immediate assistance, be sure to call us at (772) 408-9536! Do I Need a Pro For Garage Door Repairs? As the largest moving component on your Florida home, the garage door is a heavy piece of equipment that must be repaired by a professional for the safest and most efficient results. Garage door repairs are highly technical, requiring a sound knowledge to overcome any setbacks or safety concerns. Guaranteed Garage Repair recommends seeking out a professional garage door company for all repairs. While the price tag associated with DIY garage services is tempting, the overall cost in terms of safety concerns and damages to the home make certified efforts well worth making the call. My Garage Door Squeaks — When Should I Be Worried? Roll-up doors rely on springs, coils, and tracks to provide a safe and steady operation for years to come. If you notice squeaking during opening or closing operations, the cause is likely from friction between two surfaces. In many cases, adding oil to the springs can help to silence that unwanted squeak. If a simple application of oil to the top of each spring does not rectify the issue, further service may be required. In this case, we recommend reaching out to our overhead door company for garage door repairs in Stuart, Jupiter, Port St. Lucie, and beyond! Should I Invest In Torsion Springs Or Extension Springs? In many cases, homeowners look at the bottom line to help them make a purchasing decision. While investing in the cheaper option is great for saving money, in applications such as garage door springs, we recommend spending a little more. Extension springs are widely available and stretch horizontally as the door opens and closes. Torsion springs, on the other hand, wind up the torsion and do not contract or expand during movement. This design delivers safer, more reliable results to homeowners. Extension springs are less costly, but have a shorter life expectancy. How Do I Prepare For Your Garage Door Technicians? In order to inspect and offer the best garage door services, our technician will need clear access to your overhead door. The area around the door should be clear of debris and any obstructive possessions. Keeping your vehicle out of the garage and your space clear will help the Guaranteed team to deliver fast, safe, and effective repairs. After you call and schedule your appointment, we’ll be happy to provide any additional instructions per your unique situation. Tightening of all connections and bolts. Balance door for smooth operations. Inspection of wiring, circuit boards, and more. Rewinding torsion springs and adjusting opener limits. Greasing and lubricating the door assembly. 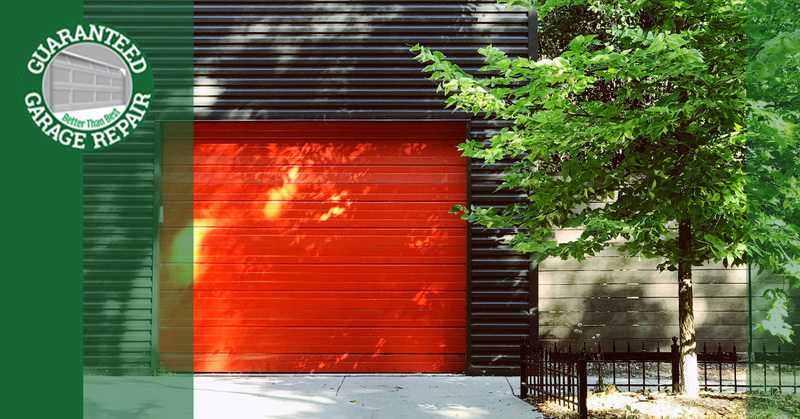 Our garage door services can be scaled to match your unique situation, including quarterly, semi-annual, and annual plans that are all effective and affordable. Is My Garage Door Under Warranty? Yes! Guaranteed Garage Repair offers the only warranty in the industry that covers parts and labor with deductibles starting around $19.95. Our garage door company is proud to set the standard for overhead door repairs, providing peace of mind for every client we assist. We’re confident that our warranty and service will have you calling us for any future needs. When it comes to garage door repairs along Florida’s Atlantic Coast, residents have long relied on Guaranteed Garage Repair for the best results. As the name entails, all of our garage door services are guaranteed to meet your needs. Contact us today for more information, and be sure to ask how our services are Better Than Best!